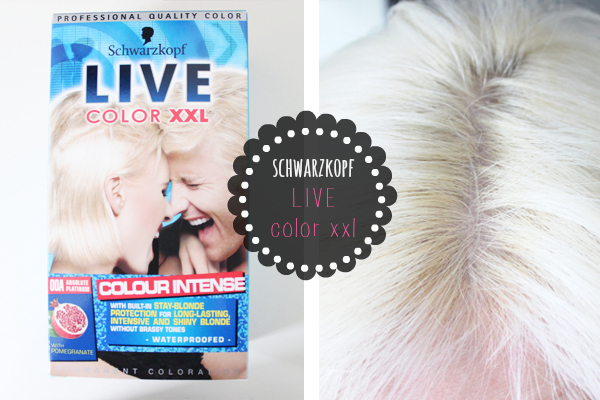 I purchased the Schwarzkopf LIVE COLOR XXL in 00A Absolute Platinum (£5) from Boots My natural hair is quite dark like a medium brown but has alot of red pigments (typical maltese hair) which means whenever we try to bleach our hair it can easily go wrong and turn out bright orange!! I needed two packets of this product using one then another a week later to fully turn my roots white. Reason for this was I didn't have control on what went on at the back of my head and not enough product was used as I had asked for help the first time round (i could see alot of orange where not enough product was used on the roots). Second time round I made sure I sat with a mirror in front of me and another one at the back to see exactly what's going on. 40 mins later and White gorgeous soft blonde hair! I must admit I keep forgetting this little patch just behind my ear which is quite funny hopefully i won't forget when it comes to doing my roots again in a couple weeks time. You get really easy-to-follow instructions on how to use the dye and to make sure you mix everything well. It even had a lovely after care treatment you leave in the hair for 2-5 minutes and wash it out and the fruity-smell left my hair so soft and yummy that it lingered for at least 2-4 hours. I was very pleased with this product and will definitely be using it every 4 weeks to touch up my roots as I was really impressed with the colour. Overall, It hasn't left my hair dry or any of the sort. DO YOU DYE YOUR HAIR AT HOME? WHAT DO YOU USE? SHARE AND LET ME KNOW IN THE COMMENTS BELOW!